Sam LaGrone at the USNI News offers a piece on the Navy officer accused of espionage and other charges. Investigators with the Navy have submitted their preliminary report and recommendation for prosecution on accusations that a U.S. Navy officer passed secrets to China and Taiwan, service officials told USNI News on Wednesday. The report will recommend to U.S. Fleet Forces commander Adm. Phil Davidson whether or not to begin court martial proceedings Lt. Cmdr. Edward Chieh-Liang Lin, 39, for alleged acts of espionage and other charges. Now the recommendation from the investigating officer has been submitted, Davidson will make the ultimate decision – based on the report’s findings – on how to proceed with the case. 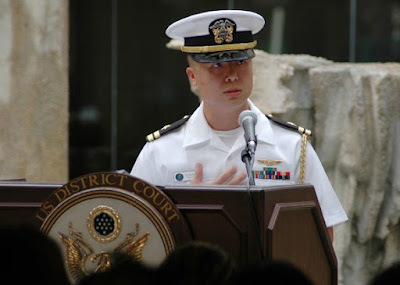 The ultimate recommendation from the investigating officer was not provided to USNI News, but several lawyers with experience in national security cases have said that the likelihood Davidson would elect to forgo a court martial for another method of non-judicial punishment under the Uniform Code of Military Justice is slim.